Meter readings and energy-saving notes for dual fuel use at home in 2013. Gas cooker/stove removed in April; switched to electric oven and induction hob which should be about carbon neutral for now but reduce footprint as the GB grid gets greener. 2013 data (kWh: e used 1658, e gen -3740, g 3859). 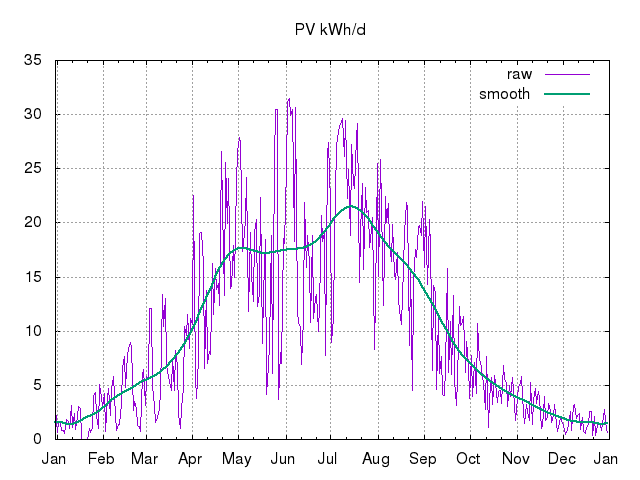 See the daily PV generation logs for 2013 as .csv and .png chart. with declining kWh used each year after allowing for weather differences (HDD), starting at 8.4MWh in 2008 and declining to 3.3MWh in 2013. 2013/01 155 (5.0/d) -55 (-1.8/d) 754 (24/d) 20121231-18:41-GMT to 20130131-23:23-GMT (31d) Meter readings: electricity generation 54.6kWh, export 35.1kWh, import 135.2kWh (thus net consumption (I+G-E) 154.5kWh); gas ~67.9m^3 (so 754kWh @ 11.1kWh/m^3). Exports passed 10MWh. Several days with no generation/exports due to snow. HDD12=231 vs 169 last January. 2013/02 124 (4.4/d) -119 (-4.2/d) 792 (28/d) 20130131-23:23-GMT to 20130228-18:27-GMT (28d) Meter readings: electricity generation 118.8kWh, export 91.8kWh, import 98.7kWh (thus net consumption (I+G-E) 123.7kWh); gas ~71.4m^3 (so 792kWh @ 11.1kWh/m^3). Generation passed 15MWh according to SunnyBeam. HDD12=230 vs 211 last February. 2013/03 147 (4.7/d) -213 (-6.9/d) 721 (23/d) 20130228-18:27-GMT to 20130331-17:15-GMT (31d) Meter readings: electricity generation 213.3kWh, export 167.2kWh, import 100.9kWh (thus net consumption (I+G-E) 147.0kWh); gas ~74.9m^3 (so 721kWh @ 11.1kWh/m^3). Imports passed 4MWh since import meter fitted (2009/09/21). HDD12=254 vs 109 last March: coldest month here since 2010/12, second coldest UK March on record. 2013/04 127 (4.2/d) -454 (-15/d) 330 (11/d) 20130331-17:15-GMT to 20130430-17:25-GMT (30d) Meter readings: electricity generation 454.3kWh, export 400.2kWh, import 72.8kWh (thus net consumption (I+G-E) 126.9kWh); gas ~29.7m^3 (so 330kWh @ 11.1kWh/m^3). Central heating off this month after prolonged cold winter. MHRV on mainly at night until the end of the month. Gas cooker/stove removed at the end of the month; switched to electric oven and induction hob which should be about carbon neutral for now but reduce footprint as the GB grid gets greener and is a step closer to eliminating direct fossil fuel use in the house. HDD12=121 vs 108 last April. 2013/05 122 (3.9/d) -524 (-17/d) 138 (4.5/d) 20130430-17:25-GMT to 20130531-17:20-GMT (31d) Meter readings: electricity generation 524.2kWh, export 454.3kWh, import 52.1kWh (thus net consumption (I+G-E) 122.0kWh); gas ~12.4m^3 (so 138kWh @ 11.1kWh/m^3). Passed 11MWh on export meter. MHRV on occasionally, mainly at night, while exterior temperatures low. With switch of cooking from gas to electricity I am expecting gas usage to drop ~1kWh/d and electricity usage to rise much less than that (preferably well under 0.5kWh/d to reduce overall carbon footprint). This month both fuels at record non-holiday lows. HDD12=50 vs 42 last May, ending the coldest spring in 50 years. 2013/06 143 (4.8/d) -554 (-18/d) 136 (4.5/d) 20130531-17:20-GMT to 20130630-17:10-GMT (30d) Meter readings: electricity generation 554.3kWh, export 474.7kWh, import 63.9kWh (thus net consumption (I+G-E) 143.5kWh); gas ~12.3m^3 (so 136kWh @ 11.1kWh/m^3). Some extra grid consumption over expected (~0.4kWh/d) because off-grid system down (restored at end of month), and Air Quality Egg in use (AQE continues to draw ~0.1kWh/d from grid). Gas usage down ~0.5kWh as last month over previous year and maybe ~0.3kWh/d extra electricity usage attributable to switch from gas cooking; too early to be clear. HDD12=8 vs 7 last June. 2013/07 106 (4.0/d) -601 (-23/d) 91 (3.4/d) 20130630-17:10-GMT to 20130727-07:35-GMT (26.5d) Meter readings: electricity generation 601.2kWh, export 536.2kWh, import 41.2kWh (thus net consumption (I+G-E) 106.2kWh); gas ~8.2m^3 (so 91kWh @ 11.1kWh/m^3). Short month as went on holiday on 27th, though gas consumption and HDD good to month end anyway, eg zero gas consumption during first holiday week with everyone away. Electricity consumption ~1.4kWh/d during first holiday week: mainly fridge+ADSL, of which ~50% imported. 2013/08 106 (3.4/d) -620 (-17/d) 58 (1.6/d) 20130727-07:35-GMT to 20130831-17:01-GMT (35.5d) Meter readings: electricity generation 620.8kWh, export 568.2kWh, import 53.9kWh (thus net consumption (I+G-E) 105.2kWh); gas ~5.3m^3 (so 58kWh @ 11.1kWh/m^3). Long month extending from morning of 27th July when we went on holday. No gas consumption at all 28th July to 9th Aug (I managed without DHW home alone for one week, and all cooking is now electric). HDD12=0 vs 2 last August. 2013/09 151 (5.0/d) -309 (-10/d) 117 (3.9/d) 20130831-17:01-GMT to 20130930-17:03-GMT (30d) Meter readings: electricity generation 309.0kWh, export 256.0kWh, import 98.3kWh (thus net consumption (I+G-E) 151.3kWh); gas ~10.5m^3 (so 117kWh @ 11.1kWh/m^3). HDD12=10 vs 17 last September. 2013/10 141 (4.5/d) -161 (-5.2/d) 102 (3.3/d) 20130930-17:03-GMT to 20131031-16:48-GMT (31d) Meter readings: electricity generation 160.7kWh, export 129.1kWh, import 109.0kWh (thus net consumption (I+G-E) 140.6kWh); gas ~9.2m^3 (so 102kWh @ 11.1kWh/m^3). Passed 13MWh exports this month. Heating not on yet, though OpenTRV units (mainly V0.09) in and running. HDD12=23 vs 55 last October. 2013/11 167 (5.6/d) -89 (-3.0/d) 301 (10/d) 20131031-16:48-GMT to 20131131-18:15-GMT (30d) Meter readings: electricity generation 88.7kWh, export 58.5kWh, import 136.6kWh (thus net consumption (I+G-E) 166.8kWh); gas ~27.1m^3 (so 301kWh @ 11.1kWh/m^3). 2013/11/11: two 3G units' outer panes shattered when outside temps reached ~3C overnight! 2013/11/15: heating on (for a couple of days it had been on intermittently), under OpenTRV control. HDD12=139 vs 133 last November (@~3kWh/d base DHW use, implies ~1.5kWh/HDD12 for CH). 2013/12 170 (5.5/d) -50 (-1.6/d) 418 (13/d) 20131131-18:15-GMT to 20131231-19:25-GMT (31d) Meter readings: electricity generation 49.8kWh, export 27.5kWh, import 147.3kWh (thus net consumption (I+G-E) 169.6kWh); gas ~37.6m^3 (so 418kWh @ 11.1kWh/m^3). 2013/12/27: house down to ~12°C (minimum ~10°C) after three days empty and only frost protection with outside temps down to ~3°C. All rooms now OpenTRV heating zones. HDD12=152 vs 190 last December and 154 previously (@~3kWh/d base DHW use, implies ~2.1kWh/HDD12 for CH, ~20--40% heating efficiency improvement since 2011 allowing for 1kWh/d cooking reduction). 1659 (4.54/d) -3750 (-10.3/d) 3859 (10.6/d) 20121231-18:41-GMT to 20131231-19:25-GMT (365d) Electricity import (1108kWh vs 1015kWh) and gross consumption (1659kWh vs 1542kWh) marginally up from 2012 as expected due to switch to electric cooker. Generation essentially unchanged. Average 189W gross. Gas consumption up a little (3859kWh vs 3707kWh) given ~150kWh cooking elimination but HDD12 (1218 vs 1043) suggests improved heating efficiency (at ~2.1kWh/HDD12). (The kWh figures agree closely with end-of year bills which also, wrongly alas, project total bills for next year for all energy of just over £400!) Similar final carbon-negative position to last year. 713kg (2.0/d) -1612kg (-4.4/d) 733kg (2.0/d) ~-0.17tCO2 (~-0.45kgCO2/d) gas/electricity emissions total for 4 people, based on 0.43kgCO2/kWh for electricity (netted) and 0.19kgCO2/kWh for gas, ie slightly carbon negative. First published 2013-01-01 , updated 2019-04-22 , rebuilt 2019-04-23 . Site copyright © 2007-2019 Damon Hart-Davis. Hosted by ExNet.